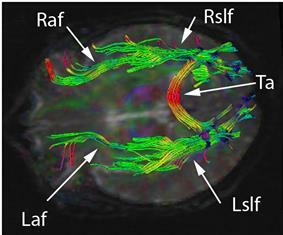 Diffusion tensor imaging image of the brain showing the right and left arcuate fasciculus (Raf & Laf). Also shown are the right and left superior longitudinal fasciculus (Rslf & Lslf), and tapetum of corpus callosum (Ta). Damage to the Laf is known to cause anomic aphasia. Anomic aphasia (also known as dysnomia, nominal aphasia, and amnesic aphasia) is a disorder which causes problems with recalling words or names. Anomia is a deficit of expressive language. The most pervasive deficit in the aphasias is anomia. Some level of anomia is seen in all of the aphasias. Anomic aphasia (anomia) is a type of aphasia characterized by problems recalling words, names, and numbers. Subjects often use circumlocutions (speaking in a roundabout way) in order to avoid a name they cannot recall or to express a certain word they cannot remember. Sometimes the subject can recall the name when given clues. Additionally, patients are able to speak with correct grammar; the main problem is finding the appropriate word to identify an object or person. Sometimes subjects may know what to do with an object, but still not be able to give a name to the object. For example, if a subject is shown an orange and asked what it is called, the subject may be well aware that the object can be peeled and eaten, and may even be able to demonstrate this by actions or even verbal responses – however, they cannot recall that the object is called an "orange." Sometimes, when a person with this condition is multilingual, they might confuse the language they are speaking in trying to find the right word. Word selection anomia occurs when the patient knows how to use an object and can correctly select the target object from a group of objects, and yet cannot name the object. Some patients with word selection anomia may exhibit selective impairment in naming particular types of objects, such as animals or colors. In the subtype known as color anomia, the patient can distinguish between colors but cannot identify them by name or name the color of an object. The patients can separate colors into categories, but they cannot name them. Semantic anomia is a disorder in which the meaning of words becomes lost. In patients with semantic anomia, a naming deficit is accompanied by a recognition deficit. Thus, unlike patients with word selection anomia, patients with semantic anomia are unable to select the correct object from a group of objects, even when provided with the name of the target object. Disconnection anomia results from the severing of connections between sensory and language cortices. Patients with disconnection anomia may exhibit modality-specific anomia, where the anomia is limited to a specific sensory modality, such as hearing. For example, a patient who is perfectly capable of naming a target object when it is presented via certain sensory modalities like audition or touch, may be unable to name the same object when the object is presented visually. Thus, in such a case, the patient's anomia arises as a consequence of a disconnect between his/her visual cortex and language cortices. Patients with disconnection anomia may also exhibit callosal anomia, in which damage to the corpus callosum prevents sensory information from being transmitted between the two hemispheres of the brain. Therefore, when sensory information is unable to reach the hemisphere that is language-dominant (typically the left hemisphere in most individuals), the result is anomia. For instance, if a patient with this type of disconnection anomia holds an object in their left hand, this somatosensory information about the object would be sent to the right hemisphere of the brain, but then would be unable to reach the left hemisphere due to callosal damage. Thus, this somatosensory information would fail to be transmitted to language areas in the left hemisphere, in turn resulting in the inability to name the object in the left hand. In this example, the patient would have no problem with naming, if the test object were to be held in the right hand. This type of anomia may also arise as a consequence of a disconnect between sensory and language cortices. Anomia is caused by damage to various parts of the parietal lobe or the temporal lobe of the brain, which is now often a targeted area of anomia research. This damage can be caused by a congenital condition or a brain trauma, such as an accident, stroke, or tumor. This type of phenomenon can be quite complex, and usually involves a breakdown in one or more pathways among various regions in the brain. Although the main causes are not specifically known, many researchers have found factors contributing to anomic aphasia. It is known that people with damage to the left hemisphere of the brain are more likely to have anomic aphasia. Broca's area, the speech production center in the brain, was linked to being the source for speech execution problems, with the use of functional magnetic resonance imaging (fMRI), now commonly used to study anomic patients. Other experts believe that damage to Wernicke's area, which is the speech comprehension area of the brain, is connected to anomia because the patients cannot comprehend the words that they are hearing. Although many experts have believed that damage to Broca's area or Wernicke's area are the main causes of anomia, current studies have shown that damage in the left parietal lobe is the epicenter of anomic aphasia. One study was conducted using a word repetition test as well as fMRI in order to see the highest level of activity as well as where the lesions are in the brain tissue. Fridrikkson, et al. saw that damage to neither Broca's area nor Wernicke's area were the sole sources of anomia in the subjects. Therefore, the original anomia model, which theorized that damage occurred on the surface of the brain in the grey matter was debunked, and it was found that the damage was in the white matter deeper in the brain, on the left hemisphere. More specifically, the damage was in a part of the nerve tract called the arcuate fasciculus, for which the mechanism of action is unknown, though it is known to connect the posterior (back) of the brain to the anterior (front) and vice versa. New data has shown that although the arcuate fascicles' main function does not include connecting Wernicke's area and Broca's area, damage to the tract does create speech problems because the speech comprehension and speech production areas are connected by this tract. Some studies have found that in right-handed people the language center is 99% in the left hemisphere; therefore, anomic aphasia almost exclusively occurs with damage to the left hemisphere. However, in left-handed people the language center is about 60% in the left hemisphere; thus, anomic aphasia can occur with damage to the right hemisphere in left-handed people. The best way to see if anomic aphasia has developed is by using verbal as well as imaging tests. The combination of the two tests seem to be most effective, since either test done alone may give false positives or false negatives. For example, the verbal test is used to see if there is a speech disorder, and whether it is a problem in speech production or in comprehension. Patients with Alzheimer's disease have speech problems that are linked to dementia or progressive aphasias which can include anomia. The imaging test, mostly done using MRI scans, is ideal for lesion mapping or viewing deterioration in the brain. However, imaging cannot diagnose anomia on its own because the lesions may not be located deep enough to damage the white matter or damage the arcuate fasciculus. However, anomic aphasia is very difficult to associate with a specific lesion location in the brain. Therefore, the combination of speech tests and imaging tests has the highest sensitivity and specificity. It is important to first do a hearing test, in case the patient cannot clearly hear the words or sentences needed in the speech repetition test. In the speech tests, the person is asked to repeat a sentence with common words; if the person cannot identify the word but he or she can describe it, then the person is highly likely to have anomic aphasia. However, to be completely sure, the test is given while a test subject is in an fMRI scanner, and the exact location of the lesions and areas activated by speech are pinpointed. Few simpler or cheaper options are available, so lesion mapping and speech repetition tests are the main ways of diagnosing anomic aphasia. There is no method available to completely cure anomic aphasia. However, there are treatments to help improve word-finding skills. Although a person with anomia may find it difficult to recall many types of words such as common nouns, proper nouns, verbs, etc., many studies have shown that treatment for object words, or nouns, has shown promise in rehabilitation research. The treatment includes visual aids, such as pictures, and the patient is asked to identify the object or activity. However, if that is not possible, then the patient is shown the same picture surrounded by words associated with the object or activity. Throughout the process, positive encouragement is provided. The treatment shows an increase in word-finding during treatment; however, word identifying decreased two weeks after the rehabilitation period. Therefore, it shows that rehabilitation effort needs to be continuous for word-finding abilities to improve from the baseline. The studies show that verbs are harder to recall or repeat, even with rehabilitation. Other methods in treating anomic aphasia include Circumlocution Induced Naming therapy (CIN), wherein the patient uses circumlocution to assist with his or her naming rather than just being told to name the item pictured after given some sort of cue. Results suggest that the patient does better in properly naming objects when undergoing this therapy because CIN strengthens the weakened link between semantics and phonology for patients with anomia, since they often know what an object is used for but cannot verbally name it. Anomia is often burdensome on the families and friends of those suffering from it. One way to overcome this burden is computer-based treatment models, effective especially when used with clinical therapy. Leemann et al. provided anomic patients with computerized-assisted therapy (CAT) sessions, along with traditional therapy sessions using treatment lists of words. Some of the patients received a drug known to help relieve symptoms of anomia (levodopa) while others received a placebo. The researchers found that the drug had no significant effects on improvement with the treatment lists, but almost all of the patients improved after the CAT sessions. They concluded that this form of computerized treatment is effective in increasing naming abilities in anomic patients. Additionally, one study researched the effects of using "excitatory (anodal) transcranial direct current stimulation" over the right temporo-parietal cortex, a brain area that seems to correlate to language. The electrical stimulation seemed to enhance language training outcome in patients with chronic aphasia. Many different populations can and do suffer from anomia. For instance, deaf patients who have suffered a stroke can demonstrate semantic and phonological errors, much like normal hearing anomic patients. Researchers have called this subtype sign anomia. Bilingual patients typically experience anomia to a greater degree in just one of their fluent languages. However, there has been conflicting evidence as to which language – first or second – suffers more. Research on children with anomia has indicated that children who undergo treatment are, for the most part, able to gain back normal language abilities, aided by brain plasticity. However, longitudinal research on children with anomic aphasia due to head injury shows that even several years after the injury, some signs of deficient word retrieval are still observed. These remaining symptoms can sometimes cause academic difficulties later on. This disorder may be extremely frustrating for people with and without the disorder. Although the person with anomic aphasia may know the specific word, they may not be able to recall it and this can be very difficult for everyone in the conversation. However, it is important to be patient and work with the person so that he or she gains confidence with his or her speech. Positive reinforcements are helpful. Although there are not many literary cases about anomic aphasia, there are many non-fiction books about living with aphasia. One of them is The Man Who Lost His Language by Sheila Hale. It is the story of Sheila Hale's husband, John Hale, a scholar who suffered a stroke and lost speech formation abilities. In her book, Sheila Hale also explains the symptoms and mechanics behind aphasia and speech formation. She adds the emotional components of dealing with a person with aphasia and how to be patient with the speech and communication. ^ a b c d Devinsky, Orrin; D'Esposito, Mark (2004). Neurology of Cognitive and Behavioral Disorders (21st ed.). pp. 194–196. ^ Mattocks, Linda; Hynd, George W. (1986). "Color anomia: Clinical, developmental, and neuropathological issues". Developmental Neuropsychology 2 (2): 101–112. ^ Woollams, AM. ; Cooper-Pye, E.; Hodges, JR.; Patterson, K. (Aug 2008). "Anomia: a doubly typical signature of semantic dementia.". Neuropsychologia 46 (10): 2503–14. ^ Fridriksson J, Moser D, Ryalls J, Bonilha L, Rorden C, Baylis G (June 2009). "Modulation of frontal lobe speech areas associated with the production and perception of speech movements". J. Speech Lang. Hear. Res. 52 (3): 812–9. ^ Hamilton AC, Martin RC, Burton PC (December 2009). "Converging functional magnetic resonance imaging evidence for a role of the left inferior frontal lobe in semantic retention during language comprehension". Cogn Neuropsychol 26 (8): 685–704. ^ a b c d e Fridriksson J, Kjartansson O, Morgan PS; et al. (August 2010). "Impaired speech repetition and left parietal lobe damage". J. Neurosci. 30 (33): 11057–61. ^ Anderson JM, Gilmore R, Roper S; et al. (October 1999). "Conduction aphasia and the arcuate fasciculus: A reexamination of the Wernicke-Geschwind model". Brain Lang 70 (1): 1–12. ^ Rohrer JD, Knight WD, Warren JE, Fox NC, Rossor MN, Warren JD (January 2008). "Word-finding difficulty: a clinical analysis of the progressive aphasias". Brain 131 (Pt 1): 8–38. ^ Harciarek M, Kertesz A (September 2011). "Primary progressive aphasias and their contribution to the contemporary knowledge about the brain-language relationship". Neuropsychol Rev 21 (3): 271–87. ^ Healy EW, Moser DC, Morrow-Odom KL, Hall DA, Fridriksson J (April 2007). "Speech perception in MRI scanner noise by persons with aphasia". J. Speech Lang. Hear. Res. 50 (2): 323–34. ^ a b c d e Wambaugh JL, Ferguson M (2007). "Application of semantic feature analysis to retrieval of action names in aphasia". J Rehabil Res Dev 44 (3): 381–94. ^ Coelho, Carl A.; McHugh, Regina E.; Boyle, Mary (2000). "Semantic feature analysis as a treatment for aphasic dysnomia: A replication". Aphasiology 14 (2): 133–142. ^ Maher LM, Raymer AM (2004). "Management of anomia". Top Stroke Rehabil 11 (1): 10–21. ^ Mätzig S, Druks J, Masterson J, Vigliocco G (June 2009). "Noun and verb differences in picture naming: past studies and new evidence". Cortex 45 (6): 738–58. ^ Francis, Dawn R.; Clark, Nina; Humphreys, Glyn W. (2002). "Circumlocution-induced naming (CIN): A treatment for effecting generalisation in anomia?". Aphasiology 16 (3): 243–259. ^ Leemann, B.; Laganaro, M.; Chetelat-Mabillard, D.; Schnider, A. (12 September 2010). "Crossover Trial of Subacute Computerized Aphasia Therapy for Anomia With the Addition of Either Levodopa or Placebo". Neurorehabilitation and Neural Repair 25 (1): 43–47. ^ Flöel, A.; Meinzer, M.; Kirstein, R.; Nijhof, S.; Deppe, M.; Knecht, S.; Breitenstein, C. (Jul 2011). "Short-term anomia training and electrical brain stimulation." (PDF). Stroke 42 (7): 2065–7. ^ Atkinson, Marshall, J.; E. Smulovitch; A. Thacker; B. Woll (2004). "Aphasia in a user of British Sign Language: Dissociation between sign and gesture". Cognitive Neuropsychology 21 (5): 537–554. ^ Mendez, Mario F. (November 2001). "Language-Selective Anomia in a Bilingual Patient". The Journal of Neuropsychiatry and Clinical Neurosciences 12: 515–516. ^ Filley, Christopher M.; Ramsberger, Gail; Menn, Lise; Wu, Jiang; Reid, Bessie Y.; Reid, Allan L. (2006). "Primary Progressive Aphasia in a Bilingual Woman". Neurocase 12: 296–299. ^ Van Hout, Anne (June 1992). "Acquired Aphasia in Children". Seminars in Pediatric Neurology 4 (2): 102–108. ^ Hale, Sheila. (2007). The man who lost his language : a case of aphasia. London ; Philadelphia: Jessica Kingsley Publishers. ^ Anthony Campbell. "Book Review - THE MAN WHO LOST HIS LANGUAGE". Retrieved 18 October 2013.